As the blog title, I am officially back with you guys (if you’all are still here!) and will definitely aim to build up this blog in the next couple of years. Although the trading/investment technique has changed, my main vision and purpose of this blog remains the same- to be free financially so as to achieve a sense of monetary security for the rest of my life. If you did not read my personal goals post posted couple of months earlier, click here and read it up! Now to some quick updates on my current trading life. Therefore, I am starting to think that I should start learning investing on stock equities, REITS, or trusts as well, leading me to read up more than a hundred of articles on related topics in the last three weeks. And I am serious. Anyone who knows me personally knows that I have an extremely inquisitive character that I make use of as an advantage- when I am suddenly interested in a topic, I will research it as intensively as finding the murderer of my loved one (Disclaimer: It’s just a metaphor, guys). Hence I am pretty sure I have read up what a typical working adult will read and learn in half a year, adding the fact that I do have some financial market knowledge to start with due to my schoolwork. Secondly, I am currently on my first week on my new full-time office job that pays well for my limited experiences and certifications. It’s a Research SME with reputable clients from government sectors and renowned company names. So I believe it will at least help out in my resume after my university studies. I am planning to take this position from June to October as I will be enlisting army in November. With a disposable salary of approx SGD$1,000 after CPF deductions and contributions to my parents (awwwww IKR), I am budgeting to save $700 from there. This includes expenses on food, drinks, transportable as well as a little guilt-free spendings budget. I have also learnt a little about budgeting via online and this ended up with me using a software called You Need A Budget 4 (YNAB 4). In short, this is the best budgeting software ever created except for the shocking pricing as it allows me to add transactions from my phone using its app and sync real-time. 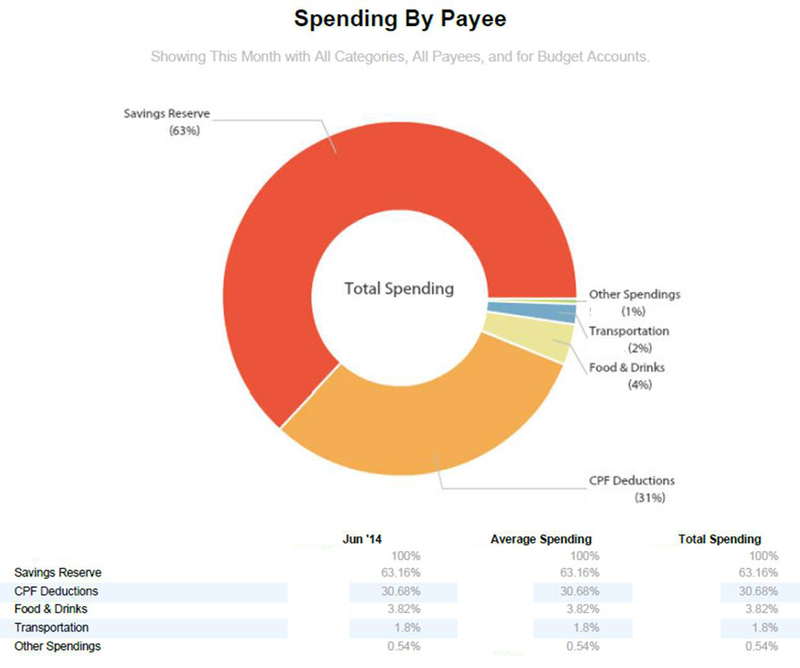 It also includes ability to create reports such as the one above with ease (my first week’s spending). Personally, I will cap this software’s pricing at less than $10. Otherwise, I will definitely highly recommend to everyone who has money that requires budgeting. Nonetheless, all these savings will go into my main savings account (without any form of ATM/Debit/Credit cards) that only has inflows. Outflows will only be towards my investment capital which brings me to my next point below. Thirdly, I have recently read up and found out about a plan by OCBC called the Blue Chip Investment Plan (BCIP). Although some other banks and institution do have these types of plans, I am using OCBC for my savings account so it would be less of a hassle and on top of that, this plan is on its last month of promotion that waives off the minimum commission fees of $5. Hence monthly investment will only be charged with the 0.3% transaction fee. And just today, I have submitted my application for this plan. I will update another post when my application is accepted as it is my first investment, I am not sure if it would be delayed or OCBC requires more information from me. In addition, if the promotion of waiving the minimum commission is not extending after this month, I might not be continuing with this plan unless I have a stock that I am sure of that encourages me to invest above $800 on itself. Reblogged this on Invest Your Time.